Self-catering accommodation in the south of England for walks in the New Forest, book a good quality holiday cottage or apartment for a comfortable self-catering holiday near the New Forest in England. Find a selection of holiday cottages and pine lodges for a restful holiday near the huge expanse of woodland, moors and common where ponies and cattle graze. 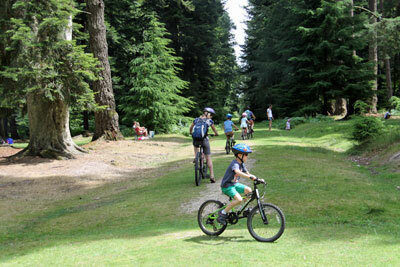 The New Forest oozes tranquillity, gentle rambles along the Tall Trees trail is truly relaxing. Learn to tell the difference between the heights of Douglas Firs and the Redwoods planted during Queen Victoria's reign. Lots of families come to picnic on the commons, cycle down woodland trails, birdwatch, go kayaking at Beaulieu, go horse riding and eat out at New Forest pubs. There is much of interest in the New Forest although the ponies are the main attraction; who can fail to be moved by groups of beautiful ponies nibbling grass on road verges or galloping across the heaths. The heather is in full bloom during August - a good month to enjoy summer and its delights. There are verious holiday cottages to rent either inside or just outside the national park. Parking in the umpteen New Forest car parks is free so that you don't have to worry about driving in. If at all possible, avoid Lyndhurst because it is traffic jam prone, use the minor roads. Ideally, stay at least 3 nights to find your feet and discover enough about the New Forest to have a brilliant break.